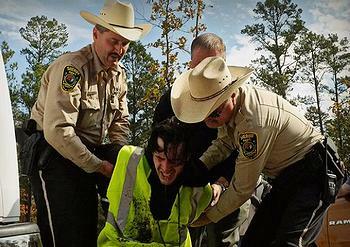 NACOGDOCHES, Texas, November 19, 2012 (ENS) – Twelve people were arrested in east Texas today as they blockaded construction of TransCanada’s Keystone XL tar sands pipeline. The protesters warn that burning the heavy fossil fuel will emit large amounts of greenhouse gases, warming the planet beyond repair. Four people locked themselves to heavy machinery used to prepare the route for the pipeline that is planned to carry heavy tarry material called bitumen, diluted with a solvent, from the tar sands of northern Alberta to refineries on the U.S. Gulf Coast. While the trans-border section of the pipeline needs a permit from President Barack Obama, sections of the pipeline within the United States do not. Those locked to the heavy machinery were joined by several others forming a human chain to block the movement of the machinery, while more than 30 people walked onto the same construction site to halt work early this morning. Meanwhile, three other protesters put up a new tree blockade at a crossing of the Angelina River, suspending themselves from 50 foot pine trees with life lines anchored to heavy machinery, effectively blocking the entirety of Keystone XL’s path. 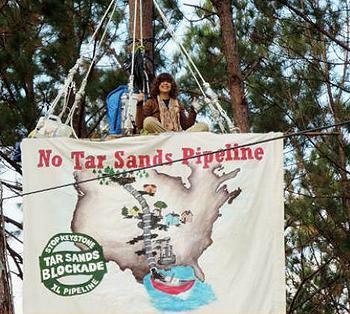 Tar Sands Blockade is a coalition of Texas and Oklahoma landowners and climate justice organizers using peaceful and sustained civil disobedience to stop the construction of TransCanada’s Keystone XL tar sands pipeline. Organizers of today’s Tar Sands Blockade Day of Action say they are acting in solidarity with local landowners struggling to protect their water and land from pipeline spills. The Keystone XL pipeline route crosses 16 large rivers in Texas, including the site of today’s tree blockade, the scenic Angelina River. Climbing 50-foot pine trees in forested bottomlands, the tree blockaders arranged their platforms and settled in for a long standoff in protection of fresh drinking and agricultural water. But within a few hours they were in custody and on their way to jail. One of the Angelina tree sitters, Lizzy Alvarado, is a cinematography student at Stephen F. Austin State University in Nacogdoches and a founder of the Nacogdoches Rat Skulls, an all female cycling advocacy organization. “What’s happening isn’t just threatening my community’s drinking water but it will threaten that of all communities along the pipeline’s path,” she said. Cherokee County sheriffs were caught on tape making multiple threats to cut the support lines of the tree blockaders, which could have been fatal for Alvarado and the other blockaders. But instead the sheriffs brought in a cherry picker to extract the blockaders. In response, a several dozen ground supporters stood in front of the truck with the cherry picker and pushed up against it in an attempt to stop it. The truck driver refused to stop until the truck hit one of the supporters and almost dragged him underneath the vehicle. To disperse the blockade supporters, law enforcement officials sprayed people in the face with pepper spray, including Jeanette Singleton, a 75 year old woman with a heart condition. Eye-witnesses say that Alvarado and another blockader were strip-searched by police after they were arrested. “Lizzy’s flexicuffs were also fastened so tightly that she was brought to tears and begging to have them loosened. When they were finally removed, they left marks on her wrists. Police were also very aggressive about removing Lizzy’s piercings,” said a Tar Sands Blockade spokesperson. All four blockaders locked to the heavy machinery were also arrested after being pepper sprayed and placed in pain compliance positions by Cherokee County sheriffs. Supporters at the ground blockade and at the tree blockade also were arrested. Those arrested will not be released until after they see a judge in the morning. Their charges are not unknown. While these multi-site actions halted Keystone XL construction this morning, local community members rallied at Lake Nacogdoches to further highlight the threats Keystone XL poses to the community’s watershed and public health. 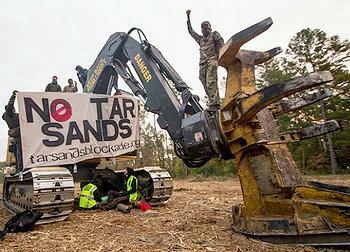 These events around the Nacogdoches area coincide with a week’s worth of events in solidarity with Tar Sands Blockade. Scheduled to occur in over 40 communities around the world, these actions highlight the urgent need to address the climate crisis. “Today’s events simply mark the latest in our sustained, community-based civil disobedience campaign, and many more communities are destined to rise up to defend their homes from TransCanada’s fraud, bullying, and reckless endangerment of their lives and fresh water,” said Seifert. Some actions have targeted policy makers or financial institutions bankrolling fossil fuel energy projects, while others rallied to address the damage done by Hurricane Sandy through community organizing and connecting extreme weather to extreme extraction. Sunday in Washington, DC, more than 3,000 gathered at the White House to call on President Barack Obama to reject the permit for the northern segment of TransCanada’s Keystone XL pipeline. Other actions are scheduled to happen today and later this week.